I loved this book. I bought it because I had met Vanessa at some event I can’t remember now, but also heard her talk about writing and that her publisher’s had bought the rights to the book before she had finished it. But I had not yet taken the plunge; not invested my time. I bought a copy and started reading and thought, mmm, different. I read on a little and thought, mmm, but it has a distinctive voice – then I was into it and just loved its poetic writing. The softly flowing dialogue, the image of a world I knew in my childhood. 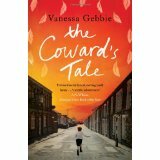 She has captured it with a lyrical lilt, a feather-light narrative that hooked me in like a friendly straightjacket. I couldn’t put it down – this gentle story of the eccentric people of a South Wales mining valley of the past. It’s Dylanesque in style and captured the atmosphere, the characters, the eccentricities I remembered. I recommend this book highly for all readers who want more than a fluffy read, who like to work to get to the core: and once you do,the images remain with a satisfying pleasure.